An overview timeline of key events relating to New Zealand's participation in the First World War, 1914-1919. 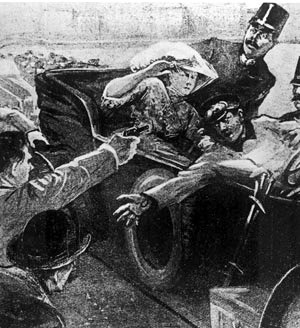 The assassination of Archduke Franz Ferdinand of Austria-Hungary in Sarajevo triggers the build-up to the First World War. 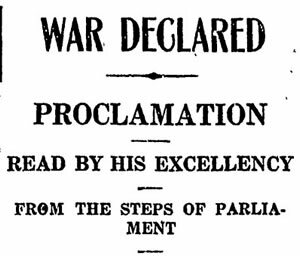 New Zealand receives the news of the outbreak of war at 1 p.m. on 5 August (NZ time). 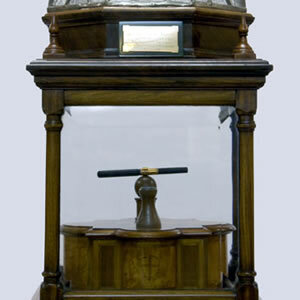 It is announced by the Governor, the Earl of Liverpool, on the steps of Parliament to a crowd of 15,000. 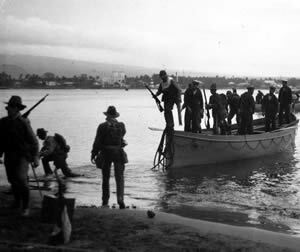 A 1374-strong 'Advance Party NZEF' captures German Samoa, the second German territory, after Togoland in Africa, to fall to Allied forces during the war. Government announces the formation of a 'Maori Contingent' of 200 men for service with the NZEF. This is expanded to 500 at the suggestion of the British War Office. The NZEF Main Body, consisting of 8454 soldiers and about 3000 horses, departs Wellington in 10 troopships. They arrive in Egypt on 3 December and establish a camp at Zeitoun, near Cairo. Image: Embarking at Lyttelton, George Cook, 1914. 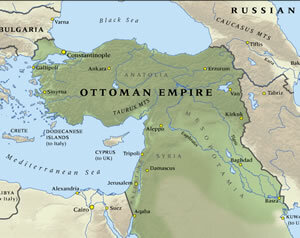 Russia declares war on the Ottoman Empire, an ally of the German and Austro-Hungarian empires. The British Empire (including New Zealand) and France declare war on the Ottoman Empire on 5 November. The NZEF combines with Australian Imperial Force units to form the Australian and New Zealand Army Corps. 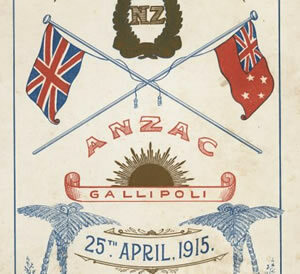 ANZAC is adopted as the label for Australian or New Zealand soldiers following the Gallipoli landings. 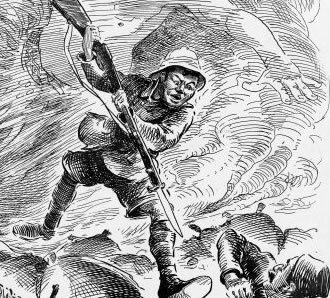 New Zealand soldiers see first combat of the war when they help defend the Suez Canal from an attack by Ottoman troops. 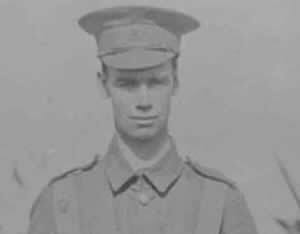 Private William Ham, severely wounded during the fighting, becomes the NZEF's first combat fatality two days later. The ANZAC land near Ari Burnu at what has become known as Anzac Cove on the Gallipoli peninsula of Turkey. The first New Zealand troops land in the late morning. 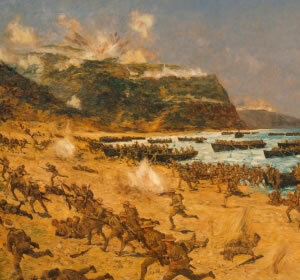 The New Zealand Brigade deploys south to Cape Helles, Gallipoli and takes part in a series of unsuccessful attacks toward the village of Krithia on the slopes of Achi Baba. They suffer over 800 casualties. 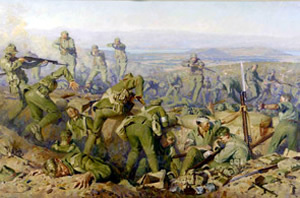 The Wellington Battalion captures the Chunuk Bair summit during the Battle of Sari Bair. New Zealand units hold the summit for two days until relieved by British troops on the night of 9-10 August. 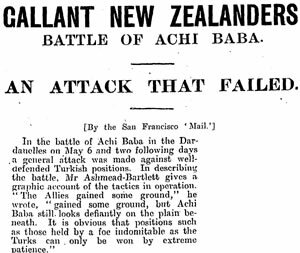 Chunuk Bair is recaptured by the Turks the next day. 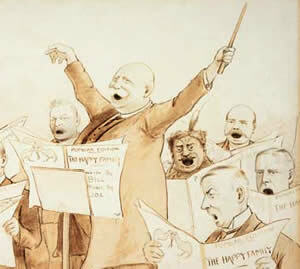 The Reform and Liberal parties join together to form a National government under the leadership of Prime Minister William Massey and Sir Joseph Ward. 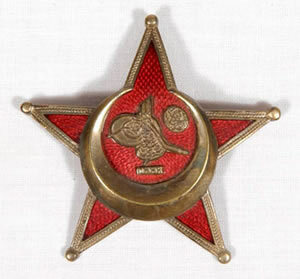 The coalition lasts until August 1919. Authorities in London decide to withdraw from the Gallipoli peninsula. 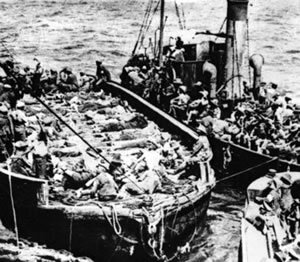 New Zealand troops are evacuated from the Anzac area between 15 and 20 December. The campaign has cost New Zealand nearly 7500 casualties, including 2721 dead. The New Zealand Division is formed with the 1st, 2nd and 3rd (Rifle) brigades. 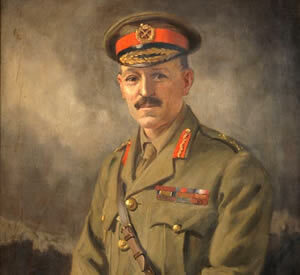 Major-General Sir Andrew Russell is given command. 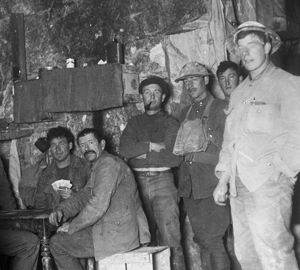 The division is sent to the Western Front and arrives in France from Egypt in April 1916. First Anzac Day services are held in New Zealand to mark the anniversary of the Gallipoli landings. 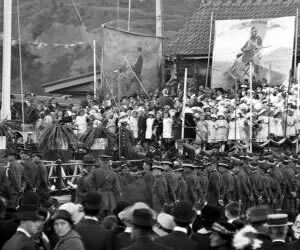 The government had announced the establishment of 'Anzac Day' as a half-day holiday on 5 April. 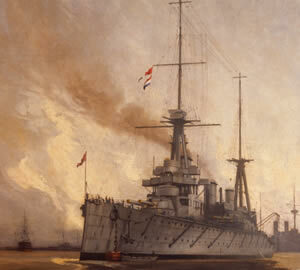 In 1909 New Zealand offered a battleship to Britain to help strengthen their naval fleet. The battle cruiser HMS New Zealand joined the British battle fleet in 1912 and took part in the Battle of Jutland (1916). 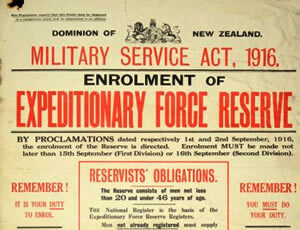 Conscription is introduced in New Zealand by the Military Service Act. As a result 32,000 conscripts serve overseas with the NZEF alongside 72,000 volunteers. The first conscription ballot is held on 16 November 1916. 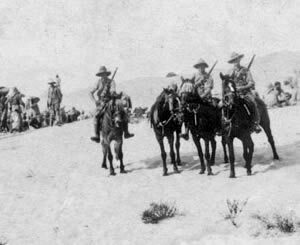 Following Gallipoli, the New Zealand Mounted Rifles Brigade take part in campaigns against Ottoman forces in Sinai and Palestine, 1916-1918. They see their first major action near Romani in the Sinai. The New Zealand Division takes part in its first major action near Flers during the Somme offensive (July-November 1916). Over the next 23 days, the division suffers 7000 casualties, including more than 1500 killed. New Zealanders become the first Allied troops to cross into Ottoman Palestine. A charge by the New Zealand Mounted Rifles Brigade results in the capture of Rafah and its Ottoman garrison on the Sinai-Palestine border. The New Zealand Division takes all its objectives, including the village of Messines. 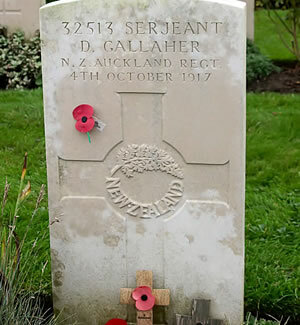 The New Zealanders suffer 3700 casualties, including 700 killed during the battle. The German armed merchant cruiser Wolf lays mines off the Three Kings Islands and off Farewell Spit two nights later. 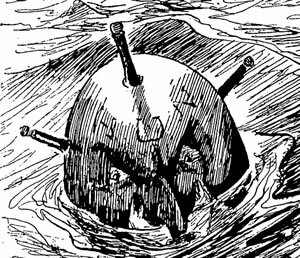 These mines sink the merchant ships Port Kembla (18 September 1917) and Wimmera (26 June 1918). 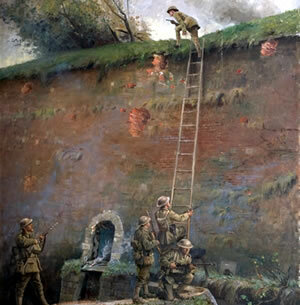 New Zealand's 1st and 4th brigades take part in a successful attack on Gravenstafel Spur, which runs off Passchendaele ridge. The attack costs more than 320 New Zealand lives, including that of former All Black captain Dave Gallaher. 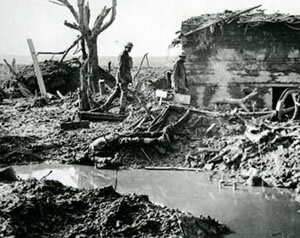 The 2nd and 3rd (Rifle) brigades suffer over 3700 casualties in a disastrous attack on Bellevue Spur, Passchendaele. About 960 men are left dead or dying. A massed German attack on 21 March tears a hole in the British front. 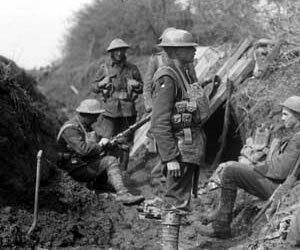 The New Zealand Division are among several units rushed to fill this gap near the Somme. They fight off several German attacks and hold their line. New Zealand mounted troops help capture Es Salt and Amman (25 September) in Jordan. 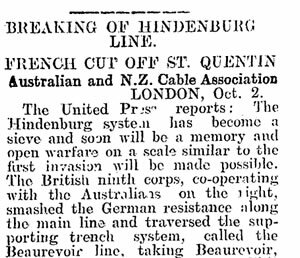 New Zealand troops help break through the Hindenburg Line - the main German defence system on the Western Front. With her armies defeated, and her German ally on the verge of collapse, the Ottoman Empire seeks an armistice with the Allies. This comes into effect on 31 October. New Zealand troops liberate the walled town of Le Quesnoy, advancing 10km and capturing nearly 2000 prisoners in the process. This is the last major action of the war for the New Zealand Division. 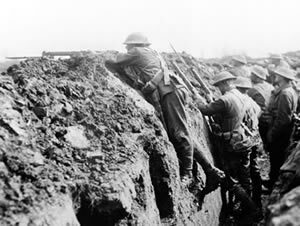 Fighting on the Western Front stops when an armistice comes into effect at 11a.m. The New Zealand Division crosses into Germany. 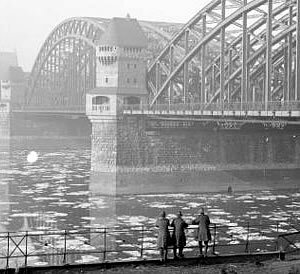 They take part in the occupation of Germany's Rhineland, stationed near Cologne. 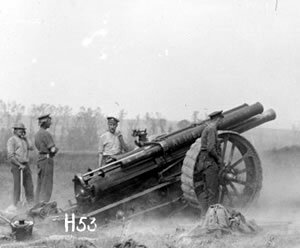 This is a short-lived assignment and the division is disbanded on 25 March 1919. New Zealand troops at Sling Camp in Bulford, England riot over delays in their repatriation home. Transport issues and the influenza pandemic mean that the last group of New Zealand soldiers do not arrive home until May 1920. 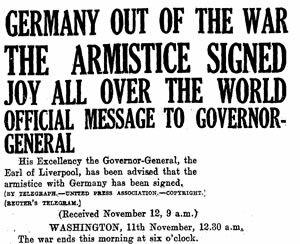 The Treaty of Versailles peace agreement is signed between Germany and the Allies. Prime Minister William Massey signs for New Zealand.